Goombario is a Goomba who lives in Goomba Village and greatly admires Mario and Luigi. As such, his name is a portmanteau of Goomba and Mario. Goombario is the first of his party members in Paper Mario, and his specialty is providing Mario with information about the various locations and enemies in the game. Thus, he is the only Party Member with two attacks which do not require FP. In Paper Mario: The Thousand-Year Door, this task is carried on by Goombella (in the French version of Paper Mario, he even talks in a similar fashion to her), in Super Paper Mario by Tippi and Tiptron, in Paper Mario: Sticker Star by Kersti and in Paper Mario: Color Splash by Huey. 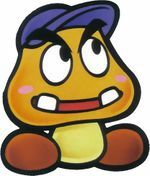 Goombario's appearance is somewhat atypical to that of a standard Goomba in that he has two flat teeth instead of the standard fangs; the only other Goomba to have this trait is Professor Frankly. He also wears a blue cap to distinguish himself from other Goombas. A portrait of Goombario and Mario. When Mario falls into Goomba Village at the start of Paper Mario, Goombario's sister, Goombaria, finds him and then lets him rest in the village's Toad House. Later, when Mario falls off the balcony in Goompa's house, Goompa and Mario find a Hammer and smash through a yellow block to get back to Goomba Village. When they return, Goompa suggests that Goombario join Mario on his adventure, and he accepts. In the field, Goombario can use his tattle to find out where Mario is and tell him about the people they meet. According to Goompapa, he is named after Mario. If Mario holds Goombaria's Dolly when returning to Goomba Village, Goombario will suggest that Mario return it to Goombaria; and if Mario says no, he would suggest that Mario return it when he is "done with it" (while Goombaria would call Mario a "meanie" if refused). At the end of the game, he is invited to the party by Princess Peach. Goombario receives three letters at the post office in Toad Town: one from Red and Blue Goomba and two from his grandparents. Goombario is very analytic and playful, as he hints at desires to play with young Toads, young Yoshis, and Merlow. He will occasionally break the fourth wall and his tattles seem to indicate a friendly rivalry with Kooper. He also stated he doesn't like eating fish, would like an Albino Dino as a pet, and that he is afraid of heights. He is also infatuated with various females in the game (namely Misstar, Vanna T., Merlee, Merluvlee, and Chanterelle). Goombario is a clever young adventurer who admires Mario. Press to have him tell you about everything nearby. His specialty is headbonking. Goombario and various other party members from Paper Mario were set to make an appearance in Paper Mario: The Thousand-Year Door, but had been removed from the final product. In Super Paper Mario, Goombario is in some photos along with the other party members in the previous Paper Mario games at Mario's House. He also appears as a Catch Card found on the twentieth floor of the Flopside Pit of 100 Trials. Goombario's name also appears in the Mario Golf: Toadstool Tour and Mario Golf: Advance Tour scorechart. Goombario appears in the Paper Mario arc in Super Mario-Kun as Mario's partner. In volume 28 of Super Wario-Kun, he and Kooper are seen with Mario before Wario pushes the trio away. Card Description: Mario and Goombario go all the way back to Paper Mario. Enemies suffer when he uses his head. Kurio Portmanteau of the Japanese name for Goomba, Kuribō (クリボー), and either the Japanese masculine suffix オ or Mario (マリオ). German Gumbario From the German name for the Goombas (Gumba) and Mario. Kùlì'ōu From the Japanese name. Or formed in a similar way to the Japanese name, from Kùlìbǎo (酷栗宝) + Mǎlì'ōu (马力欧). Goombario tattling Buzzar in battle. This page was last edited on March 28, 2019, at 12:44.